Maleaha Brown, Esq. is a 2016 graduate of Howard University School of Law and a recipient of the Family Law Certificate. Today, Ms. Brown serves as a staff attorney on the family law team at Texas RioGrande Legal Aid, the third largest legal services provider in the nation. Her practice primarily focuses on divorce, custody, and protective order litigation for low-income survivors of domestic violence and sexual assault in the South Texas region. The Family Law Certificate Program (“the FLCP”) allowed Ms. Brown to gain the knowledge, skills, and experience necessary to handle the array of family law and litigation issues presented when providing direct legal representation. Ms. Brown’s course load at Howard included skills-based classes like Family Law Practice and the Child Welfare/Family Justice Clinic, along with substantive law classes like Domestic Violence Law and Policy and the foundational Family Law class. These courses, paired with relevant internships, prepared Ms. Brown to zealously advocate for her clients. 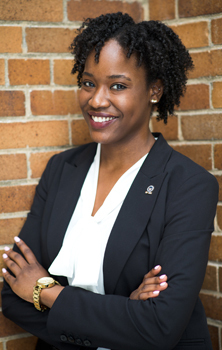 Ms. Brown has also gained invaluable mentorship as a participant in the FLCP, which cultivates relationships between students, program alumni, and program professors. Under the guidance of former Director of the Program Professor Cynthia Mabry, Ms. Brown fulfilled the program’s writing requirement with her note. With the support of the FLCP, Ms. Brown won third place in the ABA Section of Family Law’s yearly writing competition. Her note, When Pros Become Cons: Ending the NFL’s History of Domestic Violence Leniency, is published in the Spring 2016 publication of Family Law Quarterly, the ABA Section of Family Law’s scholarly journal. Additionally, the FLCP fosters a culture of community service that Ms. Brown has continued outside of the courtroom. As President of the Howard Family Law Society, Ms. Brown spoke about intimate partner abuse at the Prince George’s County Teen Dating Violence Summit. Currently, Ms. Brown serves as her legal aid’s liaison to the local domestic violence shelter. She trains shelter staff and volunteers on issues that affect her client population, including privacy and confidentiality. Notably, Ms. Brown presented to shelter Executive Directors from across Texas at the 18th Annual Legal Alliance for Survivors of Abuse Conference about responding to criminal and civil subpoenas served on their shelters. Ms. Brown values her time spent in the FLCP. Without the guidance from her mentors and the experience gained in the program, she does not believe that she would have had such a successful and smooth transition into her first year practicing law!